Today, the New York Giants and the New England Patriots battle for football supremacy, while fans sit at home with their lucky jerseys and their game day rituals. But some teams need a bit more mystical help than others. In 2000, the New Orleans Saints called in the big guns to combat the ghostly curse on their football stadium. Sports curses are nothing new. There's the famous Curse of the Bambino, in which Babe Ruth supposedly cursed the Boston Red Sox, which was blamed for the Sox's failure to win a World Series for 86 years. The Curse of Billy Penn, which allegedly kept Philadelphia sports teams from winning championships because the city built a skyscraper higher than William Penn's statue atop city hall, was believed to have been broken when iron workers attached a small figurine of Penn to the final beam of the Comcast Center. But the New Orleans Saints' curse has a particularly spooky bent, thanks to their stadium, the Superdome, being built atop an old cemetery. You would think an institution as superstitious as a sports team would know better than to build on hallowed ground, but the plans went forward, and most (although perhaps not all) of the human remains were moved to other locales. In 1967, the Saints franchise was born and the Superdome plans were drawn up. For the next 33 years, the team failed to win a single playoff game, and many wondered if the displaced spirits of Girod Street Cemetery were holding the football franchise back. In 2000, the team called in a little spiritual help. They contracted Ava Kay Jones, a Voodoo and Yoruba priestess, to appease the spiritual world and remove any ghostly impediments to the Saints' victory. Jones performed a series of rituals and prayers, calling upon the ancestors for their football support. The most public ritual took place before a playoff game against the St. Louis Rams. 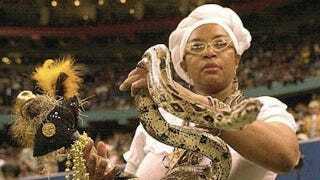 Jones draped a boa constrictor around her neck and performed the ceremony at midfield in the Superdome. That day, the Saints won their first-ever playoff win, defeating the Rams 31-28. Jones claims that, after that, she became the official Voodoo priestess of the NFL. However, just because the spirits were temporarily appeased didn't mean the curse was broken. In 2001, the Saints called Jones back to perform another ceremony before another Rams showdown. This time, however, things did not go so well. Promoters billed the event as "Who dat gris-gris?" and handed out 70,000 fliers, which referred to gris-gris, which Voodoo practitioners use as a protection against evil, as a hex or jinx. Jones felt the fliers were blasphemous, and that the team didn't appreciate her or her religion. Reportedly, she told one outlet, "I think the Saints cursed themselves." Of course, in 2010, the Saints went on to win their first Super Bowl. After all the destruction that Hurricane Katrina brought on New Orleans, perhaps even the ghosts of Girod Street thought the city could use a championship. Ava Kay Jones told her story about helping the Saints to playoff victory at one of The Moth's storytelling events. You can listen to her story on The Moth podcast.